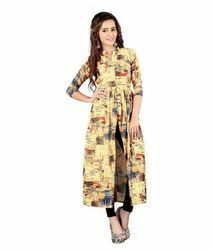 We are manufacturer, supplier and exporter of Cotton Fabric Kurti of good quality. We offer them in customized packaging to ensure damage free delivery of our products. Our product range includes Cotton Kurtis, Pure Georgette Kurtis and Poly Rayon Kurtis. These products are manufactured and designed by using optimum quality fabric. These products are highly appreciated for their attractive design and strong stitching features. We are offering these products in customized options also as per the detailed needs of our clients. Moreover, we are offering these products at reasonable prices.